Manhattan has always had its neighborhoods of commerce and industry, from the Garment Center to the Pickle District. And like those two vestiges of the late 19th century city, a booksellers’ district also popped up, this one on the warehouse blocks along Fourth Avenue south of Union Square. 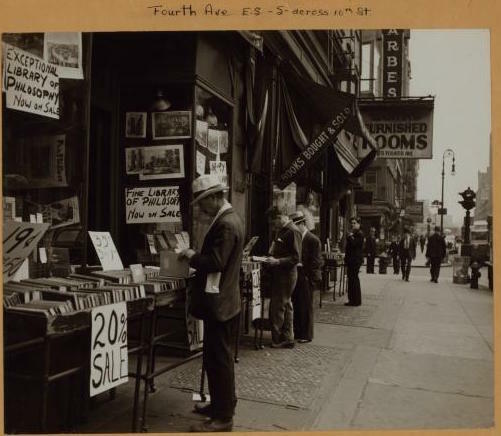 “That quarter-mile section of Fourth Avenue which lies between the Bible House [at Astor Place] and the vista of Union Square has been for more than forty years the habitat of many dealers of old books,” noted Publishers’ Weekly in 1917. 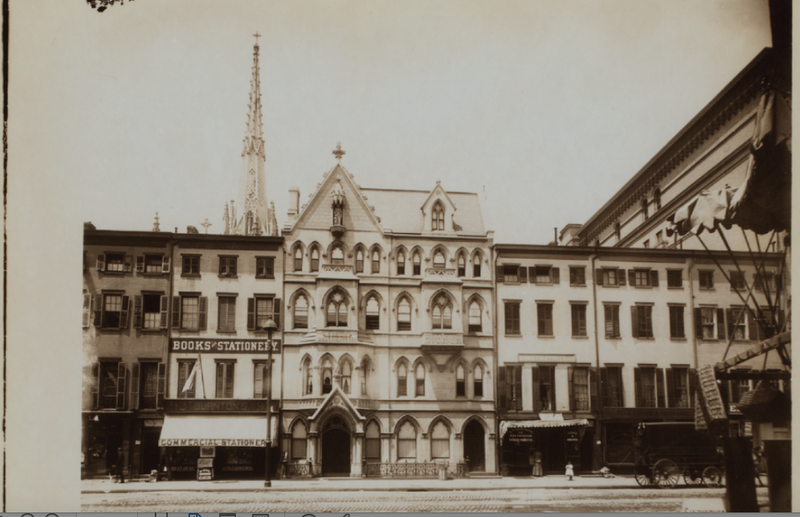 That means Booksellers’ Row—the fabled enclave where book vendors and lovers came together in dusty storefronts, buying and selling hidden treasures—dates back to the 1870s. 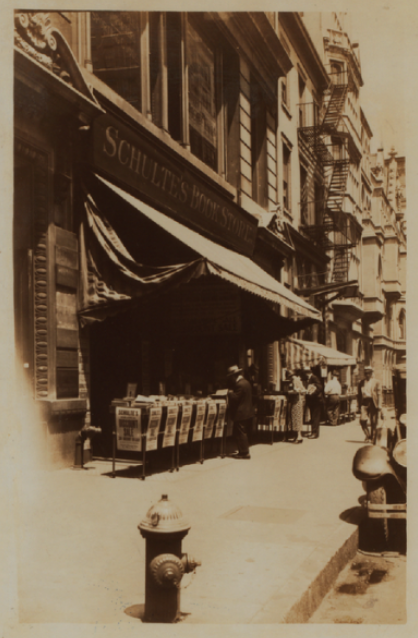 Thanks to the presence of many book publishing offices, “it admittedly is now the ‘Booksellers’ Row’ of the metropolis,” the article proclaimed. 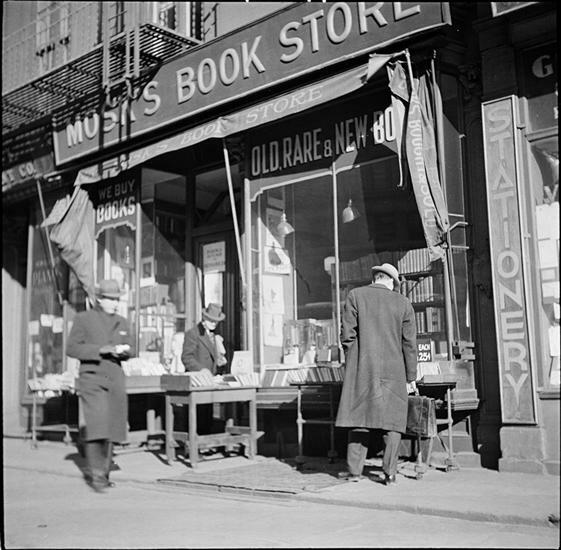 Booksellers’ Row attracted bibliophiles and casual browsers for decades; in the 1950s, more than 40 general and specialty shops lured reader to their mazes of shelves. These black and white photos, from the 1930s and 1940s, convey mystery and solitude. Who are these serious-looking readers, picking through bins and piles on tables while the rest of the city thunders along, pursuing progress and profit? 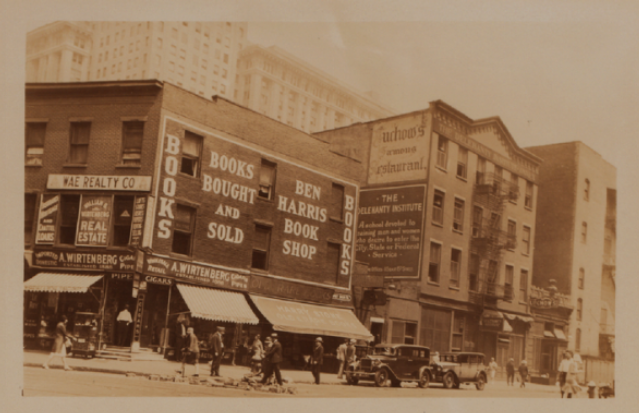 In the 1950s, Booksellers’ Row was on the wane. It was the usual culprit, of course: increasing rents. “This is their plight: They can exist only in low-rental shops, yet they need tremendous storage space,” wrote the New York Times in a 1956 piece on the dilemma of selling books in New York City. “The Commissioner [of the city’s department of commerce and public events], something of a sentimentalist, thinks he can prevent this scattering. “He thinks New York must never go so modern that it must ride roughshod over these mellow places. “He thinks something essential dies when that happens,” the Times stated. 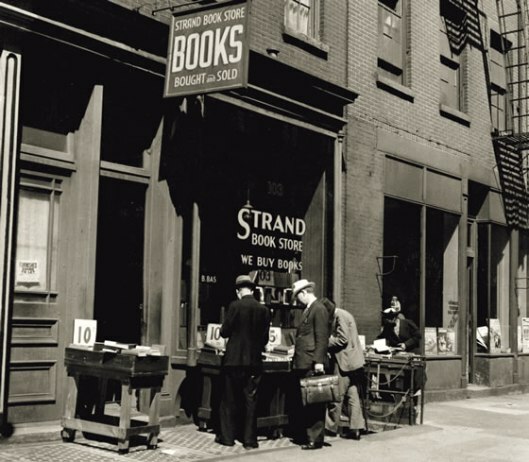 Today the Strand, opened in 1927 on Fourth Avenue and now on Broadway and 12th Street, is the only old-timer remaining. This entry was posted on June 6, 2016 at 7:49 am and is filed under East Village, Fashion and shopping, Poets and writers, Uncategorized, Union Square. You can follow any responses to this entry through the RSS 2.0 feed. You can leave a response, or trackback from your own site. Jeff Bezos killed these places. A pox on him. A main reason the bookstores were centered there was the presence of several book manufacturers. e.g. on Astor Place, who sold their over-production to these stores. The large bookstore chains was the first big wave of untenable competition. Amazon finished them off. Do you think there will ever be a Kindle Row ? Amazon had nothing to do with the demise of these stores, which carried used and antiquarian books only. They were done in by real estate values, which soared for this formerly forgotten area starting in the 1960s and 70s. One of the stores, Biblo & Tannen, was run by Jack Blblo and Jack Tannen, who wisely bought their building. When they retired and closed up shop, they sold the place for lots of money. Tannen retired to Florida, Biblo to his house on Middagh Street in Brooklyn Heights. He had a small bookstore on the corner of Middagh and Hicks, Biblo Books, open only on weekends. That store is now an architect’s office. Biblo & Tannen also had a small publishing company, Canaveral Press, one of the first publishers to reprint public domain works by Edgar Rice Burroughs (Tarzan, etc. ), touching off a wave of reprinting by Ace Books, Ballantine and other mass market publishers.